Borderlinx | Buy ValueBasket Hong Kong and ship worldwide with Borderlinx. Cheap rates guaranteed. Make sure you shop ValueBasket Hong Kong for the latest in electronic devices from a trustworthy source offering the highest in customer care. New devices are launched as they are released and are unlocked for convenience to ensure no matter where you are in the world, your device will ship and will work perfectly. ValueBasket Hong Kong top priority is customer service and care and this is what sets them apart from other online technology companies. With a vast range of products such as phones, tablets, cameras and even drones on the ValueBasket Hong Kong website you can shop for trusted brands like Galaxy, Huawei, Samsung, to name but a few. With something offered for everyone, you can browse and find the latest releases and add-ons for ValueBasket Hong Kong products too. As the name ValueBasket Hong Kong suggests, you will always find great deals and pricing to be very competitive. Ordering with ValueBasket Hong Kong online is simplified and stress free and the aftersales service is excellent, giving you peace of mind and a pleasant shopping experience. With an aim at keeping their consumers happy, their team of experts will ensure you keep coming back. No matter where you are ordering from, with Borderlinx you can get delivery to 64 countries across the world. Once you've placed your order with ValueBasket Hong Kong you can calculate cheap shipping costs, taxes and duties. 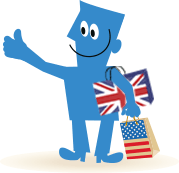 Enjoy the benefits of shopping with Borderlinx. A number of services are available through Borderlinx to make international ordering from ValueBasket Hong Kong hassle-free, including shipment value protection, free repacking and consolidation services.